Updated: On August 27,The Bureau of Economic Analysis lowered its estimate of economic growth in the second quarter to an annual rate of 1.6 percent, down from an initial estimate of 2.4 percent issued last month. “Today’s revisions to estimates of gross domestic product (GDP) confirm that the deceleration of economic growth in the second quarter of 2010 was even more pronounced than originally thought,” said Economist Josh Bivens. “In fact, without the stream of spending provided by the Recovery Act the economy would have contracted outright. The Department of Commerce reported today that gross domestic product (GDP)—the value of all final goods and services produced in the United States—rose at an annualized rate of 2.4% in the second quarter of 2010. This is a steep drop off from the 3.7% annualized growth rate in the previous quarter. The sharp deceleration in growth was driven primarily by a rapid rise in imports (which are a subtraction to GDP). Net exports shaved 2.8% off of the quarter’s annualized growth rate, the largest bite lopsided trade flows has taken out of growth in a quarter since 1982. A deceleration in the rate of inventory accumulation and slightly slower growth in consumer spending also contributed to the slowdown in growth this quarter. Final sales (a measure of GDP that strips out inventory investments) continue to grow at a very weak pace – seeing 1.3% annualized growth in the second quarter and averaging only 1.2% over the last four quarters (including the current one). Domestic demand growth (final sales to domestic purchasers) finally saw a good uptick in this quarter (rising 4.1% after averaging growth of only 1.1% over the previous nine months), yet much of this increased domestic demand was satisfied by imports instead of domestically produced goods. Net exports look poised to be a serious drag on growth going forward. After rising during the recession and providing a welcome boost to growth in that period, net exports have fallen in the past two quarters. Given that many of the United States’ major trading partners have already made commitments to fiscal austerity that will harm their short-term growth, this sector does not look poised to aid U.S. growth in the coming years. Fixed investment, both residential and non-residential, saw faster growth this quarter than previously, a good sign for the economy. Government spending, both federal and state/local, grew faster in the second quarter of this year and both made positive contributions to overall growth. Given that state and local spending had been a drag on growth for the previous nine months, this was a welcome change, albeit one that is hard to expect going forward given the extreme budget constraints being faced by state and local governments. The personal savings rate rose to 6.2% in the quarter, up from 5.5% in the previous quarter. This represents the second highest savings rate since 1993 (and the highest occurred in the same quarter last year). While a higher household savings rate could be a good thing in the longer-run, a rising rate will, all else equal, stunt consumer spending growth and other sources of demand will have to provide a boost to the economy. And there’s no particular reason to be sure that this rate has stabilized – savings rates well in excess of 7% characterized the US economy for much of the post-war era. Personal income minus transfer payments, a closely-watched proxy for private-sector income growth, grew at its fastest rate since 2006, rising at an annualized rate of 3.4% in inflation-adjusted terms. Yet, this measure remains 5.3% lower than in the last quarter of 2007 (i.e., immediately before the recession). A key measure of core inflation (the market-based price index for personal consumption expenditures minus food and energy) showed rapid deceleration. Since the second quarter of the previous year it has risen by only 1.1%, the second-lowest year-over-year change since data on this series began being tracked in 1987. This very low rate of core inflation is a clear signal that this remains an economy starved for final demand for goods and services; as long as this demand is lacking, economic growth that is rapid enough to spur recovery in the job-market will be slow in coming. Despite the fact that the economy has now seen four straight quarters of growth, the level of gross domestic product today remains lower than in the third quarter of 2007. If the average post-war path of recovery following recessions had been followed, we would now have an economy that was 7.7% larger than it was when the recession began at the end of 2007. Instead, we have an economy that is 1.1% smaller (see chart below). In short, we have a long way to go before the economy can be declared truly healthy. Lastly, it needs to be noted that this economic deceleration is occurring even with the Recovery Act providing its last strong boost to the U.S. economy. 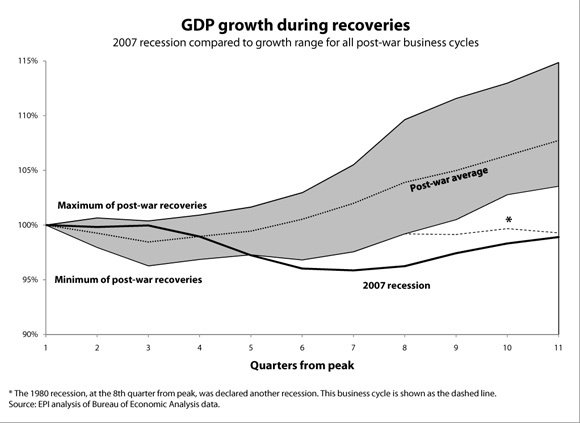 By the last quarter of 2010, the Recovery Act will no longer provide a boost to growth. What will emerge to take up the slack of fading Recovery Act spending is a troubling open question about the economy going forward. It would be wise for policymakers to provide more fiscal support to the economy, and soon.